Here at Howard Hanna, we believe in the power of community. Communities are what shape our core business of helping individuals realize the American Dream of homeownership – and communities are at the heart of the real estate business. That’s why we take giving back to our communities very seriously! It’s so important that it’s a part of our vision statement: “To give time and resources to help bring a better quality of life to those less fortunate.” Everywhere we do business, we undertake multiple initiatives to give our time and resources, and help those in our communities thrive. We’ve been fundraising for free healthcare for children for over 30 years, starting in 1988 with a $5-per-person corporate luncheon. Today, we hold our Chow Chow fundraising events across all our offices – more than 100 every year! We’ve raised over $15 million for the Hanna Children’s Free Care Fund, helping families who cannot afford healthcare for their children, or when insurance runs out or doesn’t cover a particular procedure. This year’s Chow Chow season wraps up on December 14th with Corporate and Home Office fundraising events, but many offices choose to fundraise year-round! WTAM’s Coats for Kids started 37 years ago in Cleveland, and Howard Hanna has been participating for more than 20 years to bring warm coats to children throughout Northeast Ohio. We’ve collected thousands of new and gently used coats since we began participating in the program, helping to make sure kids stay warm. 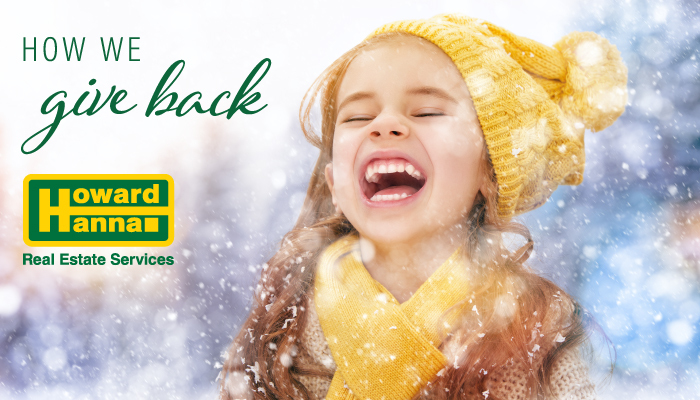 Not only are some of our Ohio offices drop-off locations for the Coats for Kids program, we also market the program with television and newspaper ads, and our agents promote it with eCards and on social media. In July of 2016, Howard Hanna Insurance Services began collecting children’s books for Children’s Hospital of Pittsburgh. Although it’s only been three years, they’ve already collected over 5,200 books for children, including picture books, board books, and coloring books. Kids in the hospital get to experience the joy of reading, and employees at Howard Hanna get the opportunity to give back. The Howard Hanna Marketing Department in New York has a special tradition of giving back to the community around the holidays. This year, we are holding a “Save a Christmas” drive to help local families in need. Real estate agents and other participants can drop off a gift for a family who might not otherwise be able to afford gifts, based on a “wish list” from the family. This year, we also held a Giving Tuesday event, featuring hot chocolate and other treats, to help encourage donations. While the drive is still underway, our agents have collected lots of different gifts so far to make an impact in their community! Although Howard Hanna offices can be found across 8 states, we believe in the power of local communities and the people who live in them. Whether it’s donating books or raising money for children’s health care, we’re committed to making the communities we serve even better places to live.